The rain sensor located on the upper end of the windshield glass senses the amount of rainfall and controls the wiping cycle for the proper interval. The more it rains, the faster the wiper operates. When the rain stops, the wiper stops. To vary the speed setting, turn the speed control knob (1). If the wiper switch is set in AUTO mode when the ignition switch is ON, the wiper will operate once to perform a self-check of the system. Set the wiper to OFF position when the wiper is not in use. 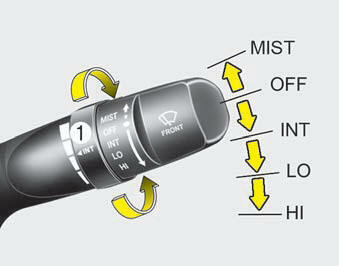 When washing the vehicle, set the wiper switch in the OFF position to stop the auto wiper operation. 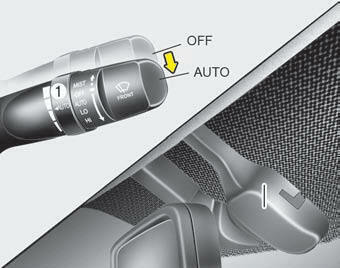 The wiper may operate and be damaged if the switch is set in the AUTO mode while washing the vehicle. Do not remove the sensor cover located on the upper end of the passenger side windshield glass. Damage to system parts could occur and may not be covered by your vehicle warranty.